Patient weighing and laboratory analysis are obviously crucial places for scales in the healthcare industry and hospitals and Central Carolina Scale can provide scales for these customers. However, there are many other places around the hospital where our scales can also improve efficiency and reduce waste. Our forklift truck scales provide weighing on the go for palletized goods. For smaller loads and parts counting, Avery Weigh-Tronix’s conveyor scales, counting scales and bench scales are as tough and reliable as our larger scales, with a higher degree of precision. Contact us for a quote today. Doran Medical DS4100 Infant ScaleDesigned for portability and accuracy, the Doran DS4100 is the perfect choice for a traveling nurse or a pediatric office. Light enough for visiting nurses, yet stable and reliable enough for busy pediatric or family practices. 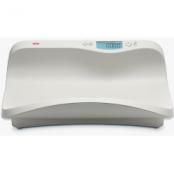 DS4100 baby scales features a one-piece, easy to sanitize design that is sturdy and lightweight. 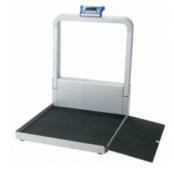 Doran Medical DS9100 Wheelchair ScaleThe ultimate in versatility and portability, the Doran DS9100 Wheelchair Scale can serve as a wheelchair scale as well as a handrail stand-on scale. To transport, the DS9100 folds & rolls effortlessly on 4 casters. DS9100 easily unfolds with built-in hydraulic assistance, & two latches hold the indicator mast in place. 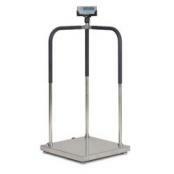 Dependable weights and measurements are extremely important in healthcare, fitness and medical settings. From accurate medical dosing, research and laboratory work to patient intake, home healthcare and fitness centers, our Rice Lake scales provide health, fitness and medical equipment to serve the industry’s need for reliable and accurate measurement. 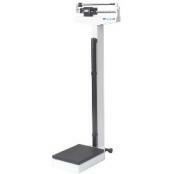 Healthcare Centers and Hospitals demand accurate patient weighing. 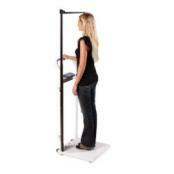 More and more health professionals choose Rice Lake Weighing Systems. 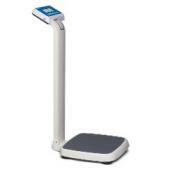 Rice Lake carries a broad selection of the highest-quality medical scales with incredible performance and value. With Allscripts™ compatibility, Rice Lake medical scales with USB, RS-232 or Bluetooth® connectivity provide added efficiency and eliminate the possibility of human error during patient weight data entry. The ideal solution for routine patient weighments, Rice Lake’s classic physician scales are updated with a sleek design for easy usability and cleaning in hygienic medical environments. 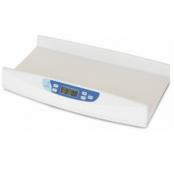 Bariatric scales provide utmost comfort and safety with added support features and optional patient seats. For patients in wheelchairs and for those who find it difficult to step up and stand on a conventional physician scale, Rice Lake’s wheelchair scale selection offers large platforms with single and dual ramps to safely weigh a wide variety of patients. 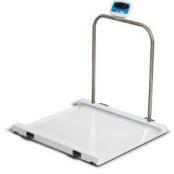 In-floor wheelchair scale versions are also available for smooth and easy transitions from floor to scale. For weighing the most precious patients, Rice Lake carries several pediatric scale models. When weighing active babies and infants, a stable weight reading can be difficult. Those who have health in mind and want to monitor and maintain a healthy weight depend on Rice Lake’s robust, yet precise home health scales. Delivering dependable durability and accuracy, Rice Lake’s high-quality digital and mechanical home scales are ideally designed and constructed for personal use. At health clubs and fitness centers, healthcare professionals can provide their patients with the most effective full-health and fitness assessment using Rice Lake’s full line of body composition analyzers (BCAs). Rice Lake’s Competitor Series is available in six models for upper body, lower body and full body analysis. The Competitor Series BCA provides an in-depth picture of health that goes beyond just body weight. BCAs not only help healthcare and fitness professionals create individualized health regimens, but through a built-in ticket printer, the BCA also provides the client with an immediate analysis breakdown of their results for lean body mass, fat mass, total body water, body mass index, Basal metabolic rate and intra- and extra-cellular water impedance. Behind-the-scenes medical applications, like healthcare center laboratories and medical research centers and institutions, rely on Rice Lake’s broad selection of bench scales and balances ideally suited for hygienic and precise medical laboratory applications. The BenchMark™ HE is a stainless steel, tabletop bench scale capable of weighing laboratory equipment and containers such as beakers, specimen vessels and dishes. Reliable and repeatable in hostile and washdown environments, the BenchMark HE is available in almost any size or capacity and features an IP69K hermetically sealed load cell. The ultimate in its versatility and compact footprint, Rice Lake’s Versa-portion® stainless steel bench scale is ideal for the precise and versatile needs of hygienic medical settings. The Versa-portion is IP68 rated and includes a bright, LED display that is easily read in dimly lit spaces. The Versa-portion can also toggle between ounces, pounds and grams with an easy-to-use interface. When precision laboratory measurement is needed, Rice Lake’s Equipoise® compact balance and TP Series compact tuning fork balance provide portable, precision weighing.